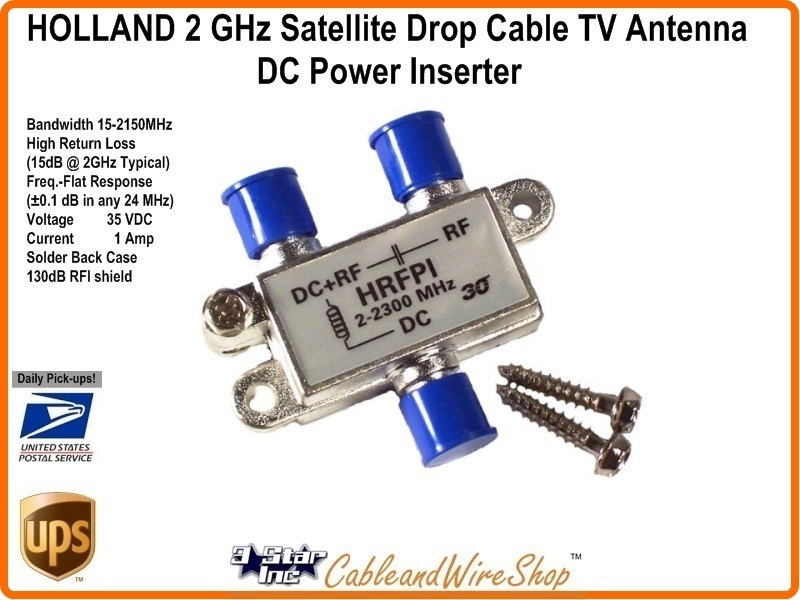 This Indoor/Outdoor Power Inserter passes 15-2150 MHz (2.2 GHz) Wideband Satellite and/or Off-Air TV Antenna and Cable TV frequencies, inserts the DC voltage from an external supply (up to 35 VDC @ 1 Amp) for powering an In-Line Amplifier or LNB(F) farther upstream on the same coaxial cable. One Port Power Passive (passes DC Voltage in one Diection only). All connections in and out of this Inserter are made by RG coaxial cable F connectors, allowing for an outside installation. The actual Power Supply (not included) is usually plugged in on the inside of the premise, with a segment or RG59 or RG6 running from inside to out, connecting the two for this purpose. Grounding Block Attached, series uses Solder Back Case for 130 dB RF shielding. HOLLAND Electronics' high performance passives are designed for distribution of digital satellite signals in applications where signal integrity is critical. The HRS and HR VS Series Splitter utilize diode protected circuitry to prevent DC backfeeding.